Look out, Danica, there’s a New Indy 500 Champ on the Horizon! The Kiddo is going to be 1 year old in about 4 weeks, I can’t believe how fast the time has gone since I last got to hold her, new from the hospital.That was the longest 2 months of my entire life, until they were able to release her and I could make the trip south to finally get to see and hold her. 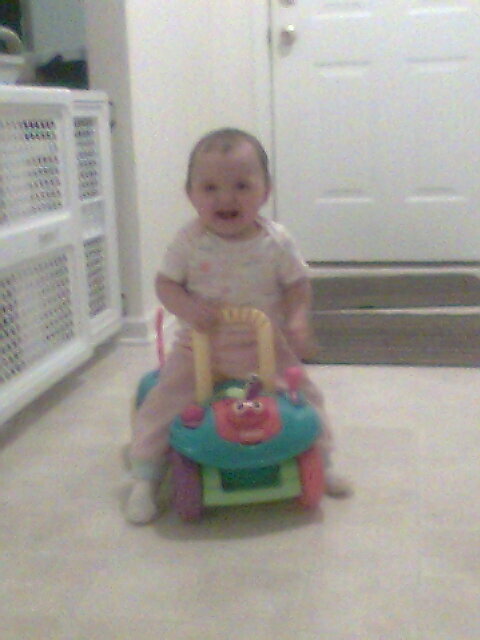 She is just about the cutest little thing, always has a smile on her face! Watching the Indianapolis Colts vs. Baltimore Ravens Playoffs. I’m fannin the Colts,and they are charging ahead, 17- 3 in the 3rd quarter… OMG. RAVENS INTERCEPT A THROW, RUN FOR 40, TACKLED AND FUMBLE>>>COLTS POSSESSION! 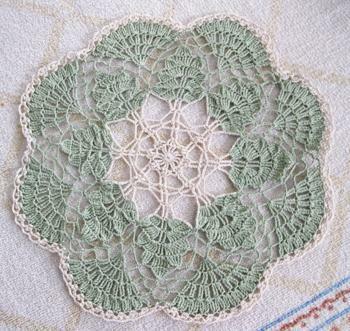 I’m nearing the end of the 3rd Woodland Lace Doily-this time it’s for D. I should just do the entire alphabet, LOL! I love this color, and plan to make one for myself next.